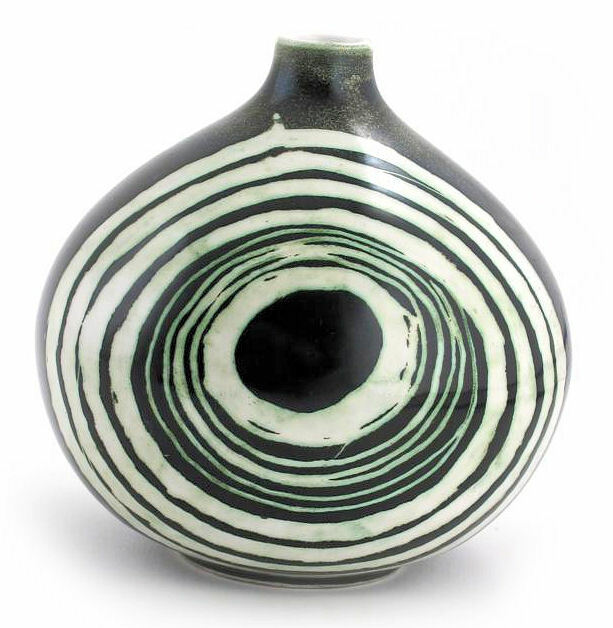 A former lecturer in Ceramics at Stoke-on-Trent College of Art, joined Poole Pottery in 1958 as full-time resident designer working on domestic ranges and oven-to-table ware. In 1961 working with Guy Sydenham he relaunched the Poole Studio, an idea suggested as early as 1950 by John Adams [Robert Jefferson, The Quiet Virtuoso by Rena Jefferson]. 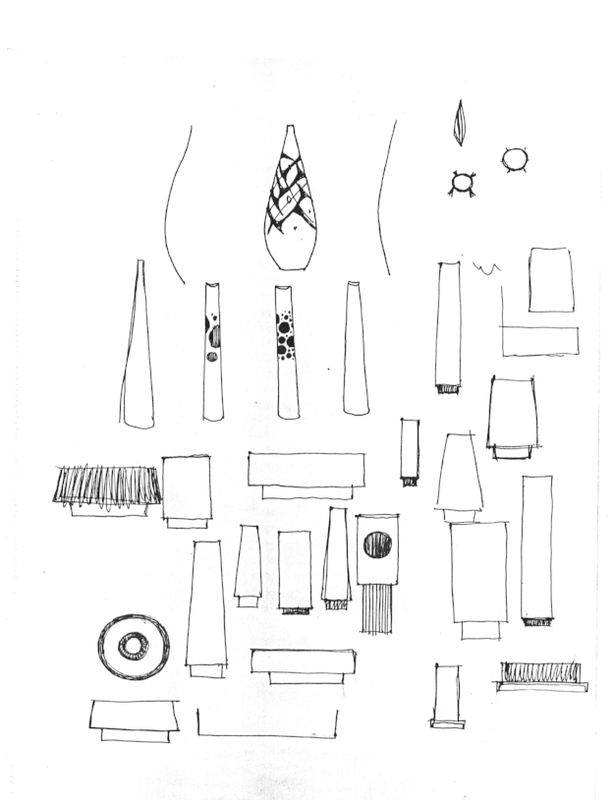 Above - extract from a Robert Jefferson sketch book including a design for the bud vase shown below and other shapes which became part of the ‘Delphis Collection’. The first exhibition of individual pieces was shown at the Tea Centre in Regent Street London in January 1961. Above left - a rare one-off design, probably by Robert Jefferson, thrown by Guy Sydenham. 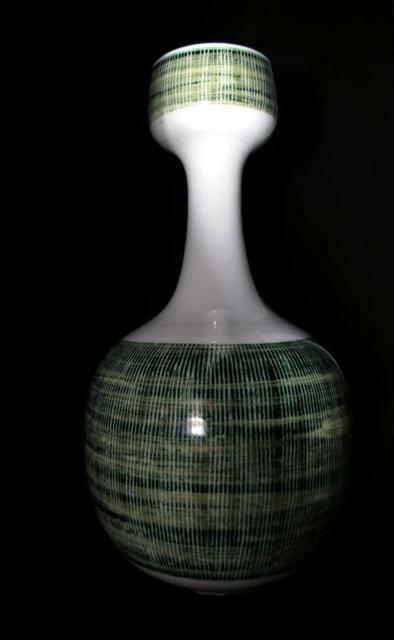 Right - a rare bud vase (8 inches) in a design by Robert Jefferson first shown at the 1961 Tea Centre exhibition. [see 20th Century Designers in Britain, Andrew Casey pp324]. One off pieces signed by Robert Jefferson are rare. 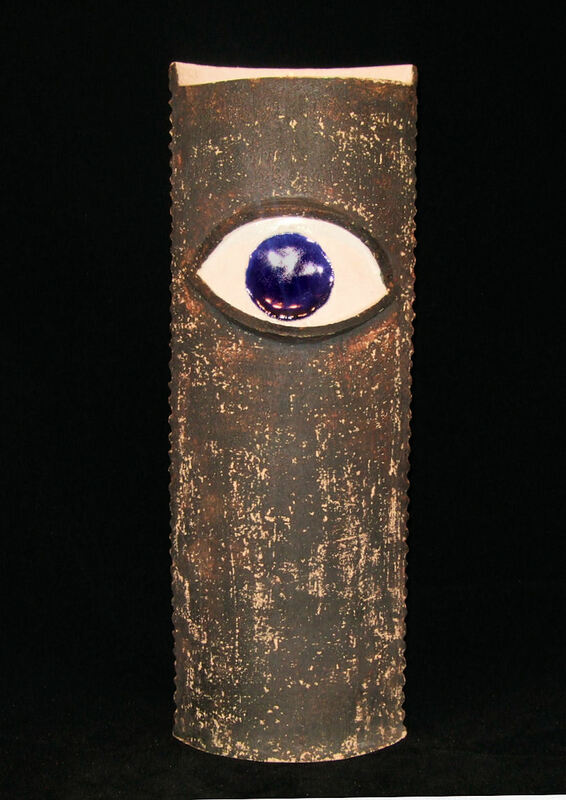 This eliptical vase stands 18 inches tall and has an 'eyepiece' to the reverse looking out on the world through an eye on the front elevation. The retail price (c1963) was 22 1/2 guineas. Impressed Poole Studio mark and Robert Jefferson mark on the vase above. Launched in October 1963, the so-called ‘Delphis Collection’ reproduced 75 or so vases designed by Robert Jefferson as a standard repeatable range. This allowed trade customers to place orders with a degree of certainty as to size, shape and price. Popular lines could be re-ordered from a catalogue. Although shapes were (to some degree) standardised, the colour, decoration, glazing and carving of each piece was unique. Individual creativity was preserved and developed within a commercial framework and with the benefit of the latest kilns, glazes and a laboratory. There were no other potteries at the time producing studio pottery within a modern industrial environment in this way. Above - on the left, bottle vase Shape 50. The early Studio pieces were thrown by Guy Sydenham and decorated by Tony Morris and Robert Jefferson. After 1963 new patterns were added and there was a crossover of paintresses from other departments. Pieces usually bear the Poole Studio ‘TV screen’ mark (H&A mark No.43). Mark No.46 (Poole Studio - England) appears from 1964-1966. The first pattern shapes are shown on the factory pattern sheets which are reproduced at Page 118 in Hayward and Atterbury (fewer patterns are shown in the 1st edition than in later editions). Above - Studio vases designed by Robert Jefferson. Pattern numbers 16 (centre) and 34. The retail price of the taller vases (13.5 inches) was 6 guineas. Above - Robert Jefferson designed vase. Above left - Vase shape 37 (just over 15 inches), retail price 10 guineas. There were problems caused by glaze dripping from the applied 'suckers' on to the body of the vase and consequently not many vases were produced in this design. 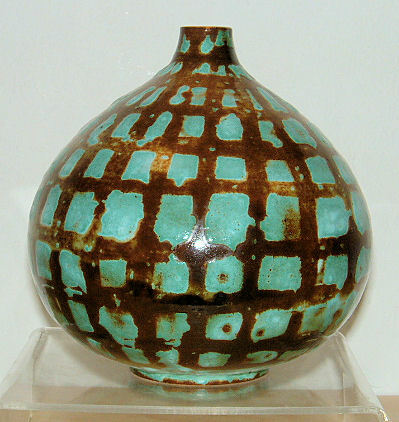 Right - tall vase (approximately 20 inches) decorated and signed by Christine Tate. Above - carved and painted monochromatic designs, tallest vase 15 1/2 inches. Left hand vase Shape 60, tallest vase Shape 50, centre front Shape 70, right (rear) Shape 61, right (front) Shape 66. Above and below -vases Shape 1, height 10 inches. The retail price in 1964 was 9 1/2 guineas. Above - examples of shape 46, height 9.5 inches. The left hand vase is dated October 1965 and was presented to the Sheriff of Poole. Above - Bottle vases Shape 50 (height 15.5 inches) in a variety of incised and decorated designs, the retail price in 1963 was 10 guineas each. Above left - bottle vases with shape 34 (13 1/2 inches) in the foreground. The right hand vases are shape 25 (18 inches) and retailed at 10 guineas. The price of the pieces in 1963 probably explains their rarity. Shapes 9 (onion vases) decorated in wax resist and (centre) shape 8. 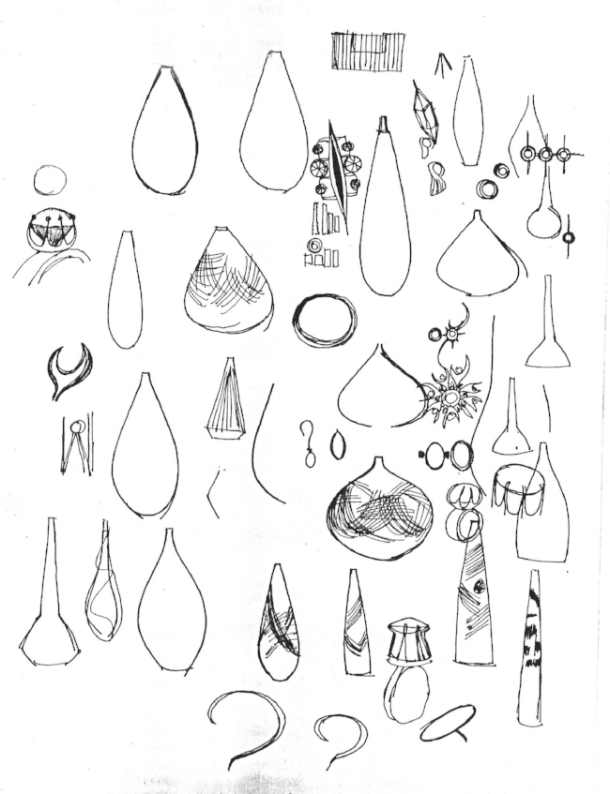 Onion vase, shape 8 (centre) and shape 33. Vase 27 (centre) was decorated using a hacksaw blade. Above - a selection of 'onion vases' - Shapes 9 and 10. Above - shape 29, sometimes known as flying saucers. Vase in an experimental aventurine type glaze - a supersaturated solution comprising metallic oxides and rutile (a natural mineral composed primarily of titanium dioxide) which formed crystals as it cooled in the firing process to produce a sparkling effect under bright light. Above left - Vase number 16, 10 1/8 inches, retail price 3 1/2 guineas. Right - 'onion vase' shape 9. Both with an aventurine type glaze.